The cuisine of Portobello stands out for its delicate mix of contradictory ingredients, which works perfectly. 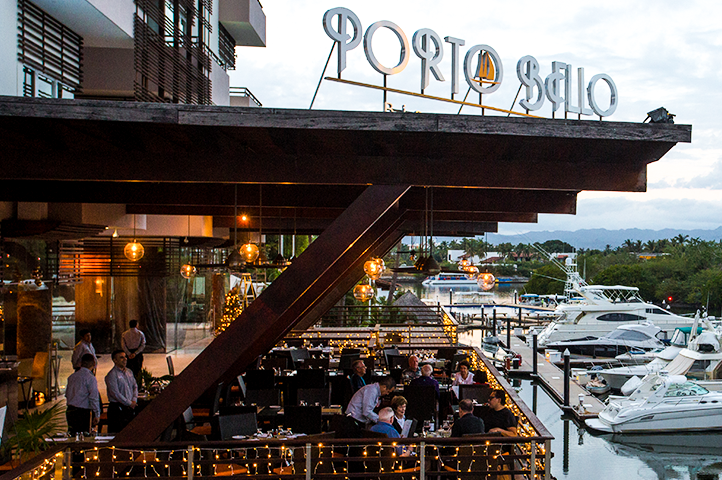 For more than 29 years, Porto Bello offers the best of Italian cuisine in a romantic terrace with such a relaxing and soft white ambiance along with stunning views towards the Marina and the Sierra Madre Occidental. You can also enjoy fine dining in the quiet atmosphere of the indoor dining room, with subtle lights and modern, contemporary decor. Porto Bello is distinguished by the unique taste of their dishes, but anything of this could be possible without one of the best Chefs in Puerto Vallarta, Riviera Nayarit and Mexico: Chef Ricardo García Alba. Chef Ricardo works with Porto Bello since the opening and always is innovating and updating his technique; you’ll never taste something like this! It doesn’t matter where you visit us, Porto Bello Ristorante Italiano or Porto Bello Bistro & Lounge; both places have Ricardo’s touch, which will astonish you with his creations and the classic dishes. Our kitchen staff knows what do you like, fresh ingredients, the correct term of your stake and that your pasta always be al dente! For us the most important is YOU! That’s why in Porto Bello you will always enjoy a great experience. Our staff is responsible for your visit will be unique because we want you that in your next stay or your next vacation, visit us again. In Porto Bello Bistro & Lounge we want you to enjoy an unforgettable soiree, that’s why we have the best Bartender of Riviera Nayarit. You will be witness of: the more exotic drinks, the classic ones and all this in a perfect atmosphere.